FN's FNP-45 high-cap is a great shooter with all the trimmings. 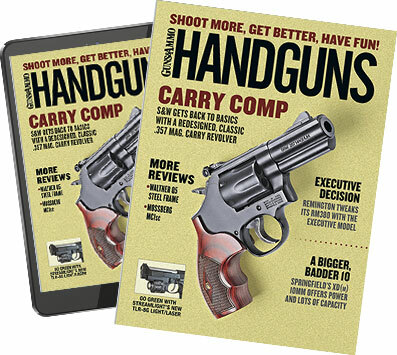 Unlike most gun reviews, this one started out as an assignment from my editor rather than a curious inquiry to the manufacturer followed by me shamelessly begging said editor for an assignment about some much-coveted carry piece. In fact, I knew nothing about the new FNP-45 before the mysterious box showed up on my front doorstep. Had I know then what I know now, our editor would have suffered a great deal more of my begging because I got the rare opportunity to go into a gun review without any preconceived notions or expectations. When I first opened the FNP-45 box, I was shocked. It is an attractive pistol to be sure, but I couldn't believe how big it is. Good photography and its sleek styling make it look much smaller in the FNH advertisements than it is in real life. The FNP-45's robust external extractor also serves as a loaded chamber indicator. The rail is a true Picatinny for mounting a light or laser. Once I got used to its size, I examined the FNP-45 a little more closely. It's a conventional DA/SA pistol built on a one-piece polymer frame with interchangeable backstrap inserts. The frame has molded checkering on the sides and molded serrations in the frontstrap. A flared lip on the bottom belies the beveled magazine well that is designed to facilitate rapid reloads. Other frame features include an integral, Picatinny-spec, accessory rail and the aforementioned interchangeable backstraps. My test pistol came with just the arched backstrap, but it should have come with a flat backstrap as well. It wasn't the company's fault; someone had tested the gun before me and had forgotten to put the additional backstrap in the box. If I'd had more time, I would have ordered it, but I found the supplied backstrap to be quite comfortable, even for my tiny hands. The backstrap is held in place with a single screw that is recessed into the backstrap. It is out of sight and does not affect the firing grip in the least. Replacing the backstrap takes just a few seconds, yet it is securely affixed once you screw it down. The frame houses the FNP-45's controls, all of which, with the exception of the disassembly lever, are ambidextrous. This includes the decocking lever, which is located just above the strong-hand thumb, and the slide release, which is just ahead of the decocker. The magazine release is in the conventional location behind the trigger guard, but rather than having to physically move the teardrop-shaped button from one side of the gun to the other--as in conventional "ambidextrous" designs--the FNP-45 has a mirror-image control on both sides of the frame. The FNP-45's disassembly lever works much like that of the Sig Sauer pistols. Lock the slide back, rotate the disassembly lever, and then ease the slide off the frame. With the slide removed, the barrel, recoil spring and guide rod all come out without any effort. Reassembly is just as fast. The FNP's polymer frame also houses several steel parts, including the ejector, fire-control parts and the front and rear slide rails. The rear rails are just .356 inch while the more substantial front rails measure 1.549 inches. The slide that rides smoothly on those rails is made from stainless bar stock. Some are finished in a durable, black Melonite while slides on the stainless model, which I tested, are left in their natural color but bead blasted to an attractive, matte finish. The FNP's slide is somewhat boxy but retains a low profile that doesn't place it too high over the hand. That's a good thing because the higher the bore is over the hand, the more muzzle flip you get. The combination of a heavy steel slide and a lightweight, polymer frame exacerbates the problem. Thankfully, that is not an issue with the FNP-45. Barrel Length 4 1/2 in. Overall Length 7 7/8 in. Sights three-dot, low profile, snag-free rear with thin-blade front. Night sights available for additional cost. Trigger DA, 10lb., 1 oz. ; SA, 4lb. Finish matte stainless slide over polymer frame (tested); black Melonite-coated stainless slide over polymer frame also available. Snag-free, low-profile sights are dovetailed into the slide fore and aft. The test gun had two white dots in the wide-notch rear sight and one in the thin front sight blade. Night sights are also available for those who are so inclined. The slide houses the FNP's robust extractor, which also serves as a loaded chamber indicator, and its 41â'„2-inch, hammer-forged barrel. The slide has 12 forward-raking grasping grooves at the rear. The FN logo, ".45 ACP," and "FNP-45" are tastefully etched on the left side of the slide, while the company name and address, "Stainless Steel" and "Made in USA" are etched on the right side. The test gun came with three 14-round magazines. At the first opportunity, I loaded them up and headed to the local sheriff's range to run some rounds through the newest addition to the FNP line. I've found that guns change when you start putting rounds through them. Sometimes, guns look and feel great in the store but don't shoot worth a darn, while others are sort of ho-hum but win you over on the range. The FNP-45 fell into the second category. There is nothing about the quality or features of the FNP that made me doubt it, but I was concerned that its big grip would make the pistol difficult to manage, especially in double-action. My concerns proved to be unfounded--thanks to the fact that the molded polymer frame doesn't need grip panels, which would make it thicker, and its 1911-esque grip angle. On the range, I forgot all about the fact that I was shooting a double-stack .45 ACP. I really liked the FNP's polymer trigger, which is short enough that I didn't have to shift my firing grip to break that first, double-action shot. The double-action trigger broke at a smooth 10 pounds, one ounce. It took only four pounds to trip the sear in single action. The test pistol digested several hundred rounds without a hiccup through a number of speed-shooting drills. While it's a large pistol, the author felt it handled quite well. Normally, I need a few boxes of ammunition to get used to a new DA/SA pistol, but thanks to its trigger and ergonomic grip, I shot the FNP-45 well right off the bat. The FNP's sights are superb. I didn't use the white dots, but I really dug the combination of the thin front blade and wider rear notch. I find this combination easy to hit with in all light conditions and distances. In fact, I like it so much that all my custom 1911s have similar sight setups. After firing a few magazines to get the feel of the sights and trigger, I got serious. I started with 150 rounds of assorted ammunition from Black Hills and Cor-Bon at the seven-yard line. The FNP-45 fed, extracted and ejected perfectly, and all the rounds landed in a tight group a hair left of the front sight but dead-on for elevation. I started slow at first but quickly worked up speed until I was shooting almost as fast as I do with my full-size 1911s. I didn't quite get there because the pistol is a wee bit top-heavy, resulting in a little more muzzle flip than I am used to with my full-size 1911s, but I was pretty darn close. After I played with it long enough to get a good feel for the sights and the trigger, I moved back to 25 yards to do some accuracy testing. Using a sandbag rest, I fired five five-shot groups with five different loads. As you can see from the accompanying accuracy table, the test pistol shot very well with a variety of loads. While I listed only average accuracy in the table, I shot a few excellent groups with the test pistol. Federal's 230-grain Hydra Shok load produced an incredible .705-inch group and a five-group average of 1.58 inches. The FNP also liked Black Hill's 185-grain load, as evidenced by its 1.18-inch best group and 1.69-inch average. That is good shooting for any pistol, especially a polymer-framed, box-stock pistol as affordable as the FNP. With the accuracy work complete, my training partner, Fernando Flores, and I set out to finish the 500 rounds of ammunition I'd brought to the range. One of us would load magazines while the other did his best to unload them as fast and accurately as possible. We shot double- and single-action and did a variety of exercises. We each fired multiple box drills, failure-to-stop drills and "empty the gun as fast as possible for the hell of it" drills. Through it all, the FNP45 ran without a hitch, and continued to put one bullet on top of another when we did our part. The FNP-45 comes with two interchangeable backstraps. It is shown here with the arched version, which fit the author's hand just fine. At the end of the day, Fernando, who also has small hands, commented on how surprised he was by his performance. When he first saw the FNP, he was expecting to have trouble managing the double-action trigger because of the pistol's size. He didn't. In fact, he shot it as well as he shoots his current duty weapon. I was equally impressed with the FNP-45. Although it is a large pistol, it handles like a much smaller one. Its 1911-style grip angle, short trigger reach and interchangeable backstraps combine to make it possible for just about anyone to shoot this pistol well. As much as I like the FNP-45, no pistol is perfect. The magazine release worked well in the sense that it ejected magazines, whether full or empty, smartly. However, it must be depressed until it's almost flush with the frame to eject the magazine. This was quite difficult for me and Fernando, as well as for my photographer, Lance Bertolino. FN could make the release a tiny bit taller to make it easier to work without appreciably increasing the chances of inadvertently shooting the magazine across the room. My only other complaint was that the decocking lever is easy to hit inadvertently. This won't take the pistol out of action, but unexpectedly going from single to double action is unnerving and can't be good for accuracy, either. I doubt FN will move that lever, but designers could make it smaller without much difficulty. Many police officers and CCW holders I know have been anxiously waiting for the .45 ACP version since the first FNP hit the street. After testing the new FNP-45, I can see why. The FNP-45 is everything a duty or defensive pistol should be. It is accurate, reliable, safe and easy to use. And, best of all, it's a heck of a value. The FNP-45 may still be a bit big for my Lilliputian mitts, but I can recommend it without hesitation to anyone with average-size or larger hands in the market for an affordable pistol they can count on when things go bump in the night.